I say that I am a third generation practitioner of the Old Religion, but in reality, there were undoubtedly many generations before my mother and her mother -- I just don’t have enough details to talk about them and so with their indulgence I don’t presume upon them. Nevertheless, the Family Tradition goes back at least three generations, and my own grown children are carrying it on into a fourth. The Tradition was an oral one, and so I know there is much that has been lost between the generations, particularly since most of the spells, correspondences, and rituals were utilized on an "as needed" basis, and much of the significance of the old holidays were blended with the local culture. My Craft Heritage is Celtic-Iberian, coming from my maternal side of the family, through the Gypsy heritage of Andalusia in Southern Spain, Galicia in Northwestern Spain, and Bahia, Brazil, where my mother's part of the family had immigrated to in the 1700’s. Without excerpting my books on my Family Tradition, here are some bits of information you might find helpful in understanding what the Green Craft is about. The singular guideposts to my family path are the Rules of Conduct, which I know have been passed through my maternal line since 1890. My mother told me these rules were recited to her by her mother, and so she passed them along to me. She used to drop her voice a register as she slowly and precisely intoned them to me throughout my childhood and youth. The sound of her deeply melodic voice stays with me whenever I say the words of the Rules, and I remember that when I was very small she would gesture with her forefinger to give emphasis to the start of each rule. Although a "War Bride" from Brazil during World War II, she soon became a US citizen and was quite fluent in English. Nevertheless, she retained a charming accent and an occasionally unusual syntax. I have kept the rules exactly as she spoke them to me. "I acknowledge the unity of the Divine, symbolized by the Divine Androgyne, aspected as Female and Male, Goddess and God, Form and Energy, Lunar and Solar Powers, honored during the Wheel of the Year at Esbats, Sabbats, and Sacred Days. I acknowledge that the Elementals Earth, Air , Fire, and Water are extensions of the Goddess and the God, both external and indwelling Kith and Kin, connecting all through Spirit. I acknowledge the immortality of the individual Spirit, comforted by the God in Underworld, refreshed by the Goddess in Summerland, choosing incarnation by form, place, and Soul purpose through the Cauldron of Rebirth. I acknowledge that the God lovingly demonstrates the life cycle in His yearly passage through the Sabbats. He is born as the Oak King of the Goddess as Mother at Yule; as infant is cleansed and carried by the Crone as Grandmother into the arms of the Mother at Imbolc to be nourished by the milk of her love. At Ostara, the Goddess transforms as Maiden and joins the youthful God that They may walk as the Lady and the Lord of the Wild Wood to awaken the Earth from the sleep of Herself as the Crone of Winter. The God and the Goddess unite at Beltane to bring renewal to the Earth, and at Their Litha wedding, the God shows His face of wisdom and age, turning from Oak King to Holly King as He begets Himself of the Goddess [Hail the Divine Mystery of the God: Father and Son!]. At Lughnassadh, the God enters into the Goddess aspected as Mother Earth, filling Her abundance with the Life Essence of His Solar Energy. He enriches the vines and barleycorn with the Essence of His Spirit at Mabon. He enters into Underworld, leaving the Goddess alone as Mother-To-Be and Crone [Hail the Divine Mystery of the Goddess: Crone and Mother-To-Be!] Through Autumn and Winter, while He leads the Wild Hunt as the Horned Hunter, gathering the dead to His Realm. He rules Underworld as the Lord of Shadows, where He offers rest, solace, and release of burdens to Spirits at the end of each incarnation. At Samhain, the God passes His Spirit through the Goddess, making thin the Veil Between the Worlds by Their Union of Shadow and Light, turning the Tomb of the Crone into the Womb of the Mother [Hail the Divine Mystery of All Hallows!] At Yule, the God as Sage offers His blessing and farewell to the children of the world, then turns His face to join them as the Infant Oak King reborn. Through the Wheel of the Year is the path of Perfect Love and Perfect Trust in the Divine demonstrated, that we may walk with the Goddess and the God in the Bond of Love. I acknowledge the Three Great Mysteries: The Ancient God as Father and Son; The Maiden Goddess as Mother and Crone; and The Union of Tomb and Womb for The Eternal Cycle of Life Immortal." I tell people that rituals may be as complicated or as simple as you desire. I know there are some folks who insist that without ritual observances the Gods die--but then they aren’t really Gods if they can "die". What these people are talking about is more like a human "art form" perception of God--a specific cultural envisionment of God rather than the God. And yes, some of these envisionments pass away--who knows today the real names by which the "Venus of Willendorf" was addressed? or the "Minoan Snake Goddess"? But the imagery remains, is transmuted and transformed into what we do recognize--be this the Mother Goddess, Gaia, Rhea, Medusa, Sophia, etc. I do feel that rituals are meant not for the Divine but for us, to help us connect with the Deities--or with the spiritual energy of the cosmos, both macro and micro, if you don’t feel comfortable addressing Deities. And what about pantheons? Again, some people write emphatically that you must remain within a specific pantheon, learn the ancient language of the culture, and learn the relevant myths belonging to the deities. However, personal experience has led me to believe that none of this is necessary. The ancient languages say the same things as our modern language, so unless you are reading an ancient manuscript, there is no need to imagine that the Divine is not able to comprehend your modern speech or is unable to communicate with you in your own language. The ancient names of the Deities generally translate as descriptions, so that even with names like the Norse deities Frey and Freya, or the pre-Islamic Bedouin deities Allah and Allat, the translations are the same: Lord and Lady. Why does it make the terms Lord and Lady "generic" when the proper names used by people in the past were those very words in their own language? Also, the idea of accidentally calling upon the wrong Deity aspect is like something from a bad horror movie. More often than not, it is the Deity who contacts YOU, and sometimes you may be quite surprised by who appears. When I asked for help in determining what was my totem animal, it was Epona who answered, although I had never approached Her before--of course now I have a statue and shrine to her. I do feel the Divine is within all things, and able to reach you in whatever way is necessary. Let me explain what I mean. When a friend took me to a Native American women’s circle [and yes, it was led by a Native American woman], I felt a lot of resonance with the spiritual concepts, and did some reading of the "Clan Mother" books by Jamie Sams--wonderful stuff. Although I only attended one meeting, months later when I was wrestling with a question--should I accept the friendly overture of someone who had betrayed that trust in the past--I dreamt that night that I was with an elderly Native American woman who was covered by a faded, striped blanket, standing near an old wood cabin. On the porch, sitting upright in a ladder-back rocking chair was a large black hare. The woman spoke to me and said, "I am Grandmother Ose--listen to what Grandfather Hare has to say." So I went up the steps to the porch, and Grandfather Hare said to me, "The wild things stay wild." I nodded, and he said, "Kiss me." I started to lean towards him, but saw his large front teeth and backed off. He said wisely, "You understand. The wild things stay wild." I asked if I could give him a hug, and he said I could, which I did without incurring any harm, and I awoke. I had my answer--there was no change in the person’s behavior, and if I let myself be suckered by a friendly overture, I would again be betrayed, but I didn’t have to make a fuss about it either. I looked up Ose in the dictionary and discovered that it is the genus name of the European Blackbird. The more subtle message of the dream was that no matter the cultural setting, the Divine is still the Divine -- the Goddess of my European heritage could just as easily drape Herself in the blanket of the Native American Grandmother deity image -- be a Clan Mother, as it were. And the God could be wily old Grandfather Hare, an aspect of the Native American Great Father. I have had meaningful and spiritually uplifting encounters with Bast, Sekhmet [whom I found to be very understanding], and even Elegba [an endearing and charming hoot]. Trust me when I tell you that there is no way you are going to say, "Oh, sorry, but you’re not in my pantheon." When the Divine takes on a deity image and visits you, there is no denying the validity of that image. Not all encounters are in dreams, and some can be quite surprising. Doing a ritual and finding yourself suddenly transported to the presence of the Divine is called an "ecstatic experience" and can happen without any strenuous activity -- such as drumming, dancing, or deep meditation--taking place. Seeing the Goddess as the pale Lady of the Moon in a simple white sleeveless gown and with long dark tresses, and seeing the God of the Wild Wood with antlers and broad hairy chest, may be what gives visual form to the "generic" terms of Lady and Lord, or Goddess and God. Many people in the Craft have such experiences, and these are certainly life-altering events and part of the joy of the Old Religion. The door between the Self and the Divine stands open, the Light fills your life, and you are changed. The traditional Goddess of my family is Bendidia, or Bendis, who is the Thracian Goddess of the Dark Moon. She holds a twig in her hand to show the way to Underworld, and hence to new life. She is the Goddess of Magic, Secrets, Occult Wisdom, and is the ancient Goddess of Witches. But She is also the Goddess by any name, and is the Triple Goddess of Maiden, Mother, and Crone. There may be a connection between Her and Hecate, since Hecate was originally a Thracian Goddess before adopted by the Greeks and called a Titan by them, and both give passage to Underworld. The God of my family is Shiva, but He is also the God by any name, and is the Triple God of Youth, Father, and Sage identifiable with Dionysus, Cernunnos, Frey, and Herne. He is usually depicted dancing in a ring of fire, or sitting upon a dais, horned with a sheaf of wheat between the horns, and surrounded by animals wild and domestic, or sitting upon a tiger skin in meditation. These images show Him as the Lord of the Cosmic Dance, Lord of Beasts/Wildwood/Harvest, and Great Ascetic. He is Horned Hunter, Greenman, Lord of Light, Lord of Shadows, and Wed to the Triple Goddess. As the simple stone called the Lingum, He is the God of Fertility--the One who seeds the Earth and the Universe. Yet over the years, other aspects have come into my home and heart, so it is no surprise to me that the Tradition is embracing other imagery within my own family. This is because the Craft is alive, and like all living things, it grows. To do otherwise is to stagnate and die. 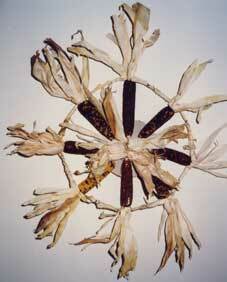 In my books on Green Witchcraft I have attempted to bring to the public forum my family heritage and practice. One thing comforting thing about the Green Path is that it is very accommodating to individual tastes and circumstances. There are basically three styles of the Craft, and while you might move from one style to another, you could just as easily remain in which ever one feels right or combine styles as your temperament inclines. In my Book of Shadows & Grimoire, I state: "The names by which the Lord and the Lady are addressed are not important, for They are One by whatever Names They are known, and They dwell within. They give life to be lived fully and with enjoyment, and we are reborn to learn until we are reunited with Them. Because people are of the Earth, She should be revered." In any style of practice, however, the Green Path focuses on celebrating the turning of the Wheel of the Year through living the Craft. This approach to the Green Craft comes under the umbrella of a mainstream religion so that the Craft is practiced and magics are worked using the new names of the deities of power, and the old holidays are celebrated with the culturally accepted ones, but with an understanding of the Pagan originals. Folk Art Witches may invoke the Power as the energies of deities, angels, saints, and the Holy Spirit, and may adapt other cultural images into their practice. 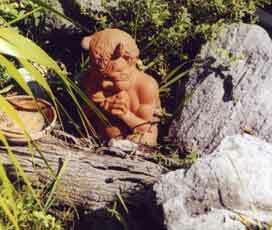 Older images of Nature deities, such as Pan, may be unobtrusicely incorporated into the Practicioner's environment. This variety of Green Craft as a Natural Witchcraft addresses the Mannuz -- what my mother pronounced as 'Mahn-nu' -- or the Self, which in the Runes, is Mannaz, the Human or the Self. My mother had knowledge of the symbols of this ancient system, but in an unusual fashion so that I still puzzle over the twists and turns in the heritage passed down to me. 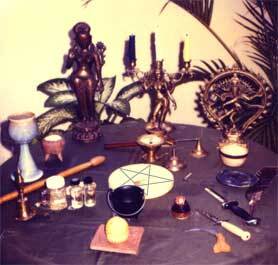 In this style of practice, however, the Self is elevated to a union with the Universe, enhancing the personal power of the Witch through the energies of herbs and natural objects and directing this to accomplish a goal. 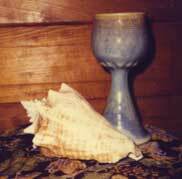 Ritual, magical tools, and conscious spellwork function through the Elementals, and a Grimoire is created to codify tables of magical correspondences for a successful practice. Religion plays no part, save as the Witch and the Unnamed All work together through Nature with honesty, instinct, and intuition, which I address in Witchcraft: An Alternative Path. 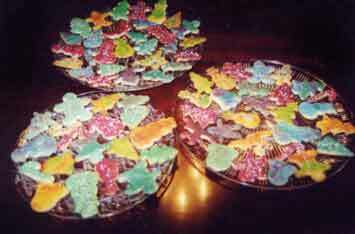 With this style of practice the holidays are lived and experienced rather than observed as ritual Sabbats and Esbats. This type of Green Craft identifies the Goddess and the God in partnership with the Witch through a Self-Initiation for introduction and learning, and later by complete union in a Self-Dedication. As a religion, magic is often directed through personal communion with the God and the Goddess, identified as Male and Female in Balance and as One. There are rituals of religious observance including Sabbats and Esbats, and special days honoring aspects and manifestations of the Divine throughout the Wheel of the Year, the latter may be added to the personal calendar according to those aspects of the Divine recognized by the Practitioner. Materials: lavender and vervain herbs; lavender material cut in a 6 inch square, small moonstone or fluorite, pale green or pale lavender ribbon, any decorative items such as feathers, holey stones, shells, etc. to adorn the outside of the bag. d. create a loop with which to hang the bag from a tree branch, etc. "I call upon the Powers of the Elementals to enliven the magic and stir the energies into this charm that it may call Fair Ones to me! By Earth [sprinkle with salt/root], Air [pass through incense smoke], Fire [pass through candle flame],and Water [sprinkle with blessed water], I consecrate this Charm to my use. (Set Charm Bag on the Pentacle and place hands together with palms down over the Charm and visualize the energy rising up from the Earth through your feet and out your palms into the Charm Bag) With the blessings of the Goddess and the God, this Charm is charged and energized that as I will, SO MOTE IT BE!" "Come to me Blessed Fair Ones, By Midsummer’s light of thy Faerie Moon! Bless this charm and grant my boon! With this Charm may ye ever abide in friendship with me, for as this I will, So Mote It Be!"